the "instructions" are known as "code" or "script"
...whenever i ask you for message, give me back the text 'Hi there Flash! example sentence: "declare a new variable named message, and assign it the value "Hi there Flash!" don't mistake the equality operator (two equal signs ==) with the assignment operator (one equal sign =)! but what if we want to count to 500? let's see it all in action! 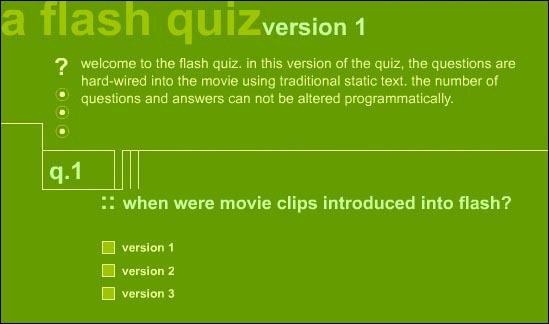 frame 1, question 1 layer, add text: "1) When were movie clips introduced into Flash?" change the question number from "1" to "2"
change the text of the question to, "When was MP3 audio support added to Flash?" for example, avoid single letters, like "x" or abbreviations, like "tc"
if we add frames before frame 10, our code breaks! how do we set a variable when a button is pressed? frame 20, quiz end layer, add text "Thank you for taking the quiz!" how do we know which one to set? ...hence, handlers for question 1 and question 2 answer buttons can be the same! now imagine a 100-question quiz! if the number of questions in correctAnswers changes, numQuestions updates automatically! code is fun, even when you only know a little!